How to set permissions to folders? How to set permissions for folders? Granting permissions to a folder, allows admin users to easily give access to other sub-users to see an entire group of forms. This is very useful because instead of selecting each form separately, all of them can be included in the same folder and will have the same permissions. Now let’s take a look at how it works. All forms included in Folder A, will inherit the folder’s permissions. The same rule applies to the sub-folders. However, if there are any rights specifically set to a form, then it will overwrite any other permissions given to folders. The forms that don’t have any specific permissions, acquire in reverse order the permissions on folders. 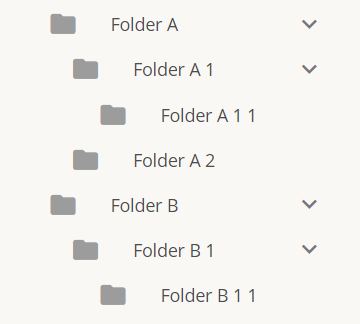 Based on the model above, if a form is added to the A 1 folder it will take this folder’s rights. But if a form is included in the A 2 folder, it will have the same permissions as Folder A, because as we can see in the example above, the Folder A 2 wasn’t granted any access. A form in A 1 1 takes this folder’s permissions. Any form added in Folder B 1 1 will have no permissions, because there is none granted to Folder B, Folder B 1 or Folder B 1 1. How to set up Access Levels and Permissions for web forms? What is the subaccount password? How much control do subusers have over their forms? How many subusers can I create on my master account?